I’m always on the lookout for easy quinoa recipes that I can whip up for my family. My goal is to serve it at least twice a week. Quinoa (“keen-wah”) is one of those foods that I want more of every time I eat it. If you haven’t tried it, I recommend you do. It’s a healthy whole-grain food with a slightly nutty taste. It’s also so nutritious! One cup of cooked quinoa has 222 calories. The hard part for me is knowing how to prepare it, especially in ways that my kids will like. It has more texture than rice and they’re not fans of couscous, which is similar. Luckily, these 7 recipes from talented food bloggers make it so easy! Make sure to visit their blogs for all of their other great recipes, too. This recipe (see photo above) from Chelsea’s Messy Apron has quinoa, lime, soy sauce, honey, cumin, and more. 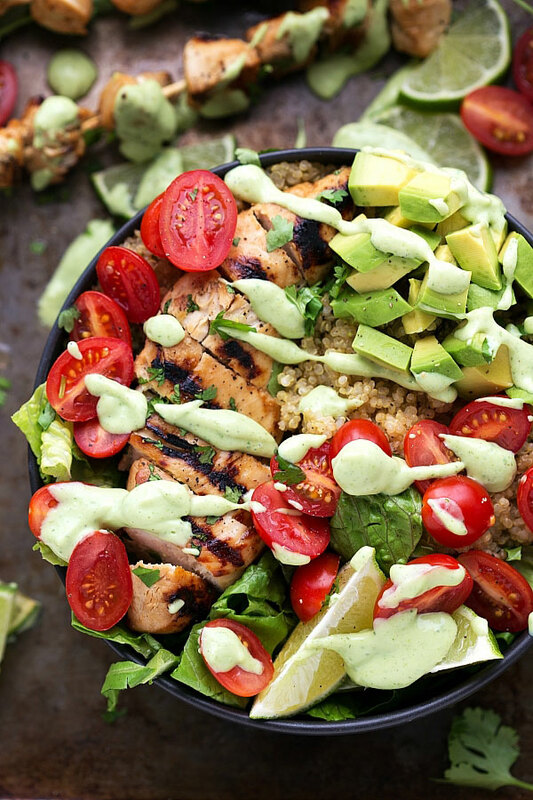 Nourished Kitchen makes this recipe with cilantro, avocado, quinoa, onion, jalapeno, and more. You can find this recipe on Table for Two, and it includes broccoli, quinoa, butternut squash, carrots, zucchini, and more. Ambitious Kitchen cooks these quinoa beet burgers with flaxseed meal, dates, coriander, breadcrumbs, and more. This recipe from Super Healthy Kids includes black beans, tomatoes, quinoa, chili powder, corn, and other healthy ingredients. This vegan recipe from The Girl Who Ate Everything has onions, quinoa, lime juice, cumin, black beans, avocado, and more. Minimalist Baker prepares this recipe with quinoa, cucumber, carrot, red pepper, cilantro, and mint. The sauce includes cashews, soy sauce, chili garlic sauce, and more. What’s your favorite easy quinoa recipe? Please leave a comment.